Orangery & Glazed Extensions -why move if you can improve? The Orangery and Glazed Extension is very popular right now with families in Banstead, Sutton, Cheam and many other Surrey areas. Did you know there is a well know Orangery at Kensington Palace! With property prices in the local area continuing to rise, it is often more cost effective to actually extend and improve your Surrey Home instead of thinking about purchasing a larger one. Consider the price of the larger property first, the extra funds that will be required not to mention “dead money” such as the dreaded stamp duty and solicitors fees. 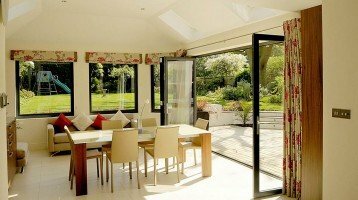 This is where a Glazed Extension or Orangery can give your Surrey home a new lease of life with the useful extension to your living or dining space. There are many options available to you with a Cheam Glazed Extension and a Cheam Orangery. A Playroom, a larger kitchen, a dining area or a new workspace. An Orangery can give so much extra space! Whatever your needs a Glazed Extension or orangery really can transform your living space. Glazed extensions in Surrey and London are on the increase and with the flexibility and value they add to your Surrey Home without the need for expensive moving costs you can see clearly why. Contact Cheam Windows if you would like an free no obligation chat. We specialise in all aspects of Orangery building from start to finish. This includes the initial design and planning advice and then through to base work and construction. We will also help and guide you with any plumbing and electrical requirements. You may also want heating added or new floor-coverings, patios, paths and general landscaping. We can cover all of these for you.